Travelers are at the RDU preparing to depart at 11:30 for Boston. From left, Carnell and Debbie Lamm, June and Lance Cherry, and Jessie and Tom Thorne. Connie Dupree, Retha Deaton, Laura Ashley Lamm, and Margaret Aldridge visiting the Boston Public Gardens established in 1837. Retha Deaton enjoys a beverage in Cheers, the landmark pub that inspired the hit television series. 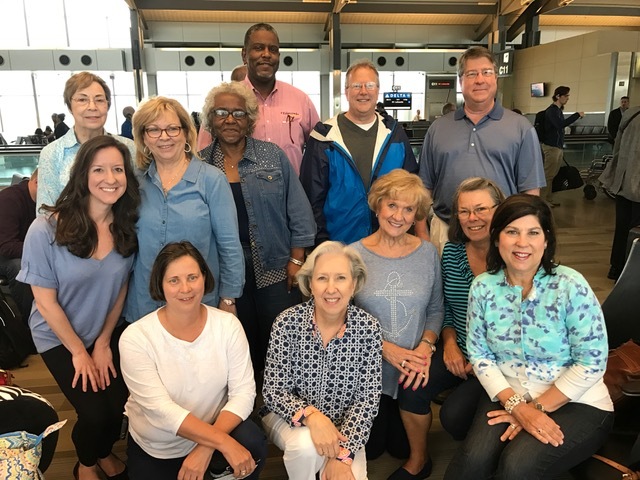 The ECC travelers left the Tarboro campus at 8 a.m. headed to RDU on May 23; the flight took off at 11:30 a.m. for Boston. Arriving at 1:30, the group made their way to the hotel to check in. Famished, several ventured out enjoy lunch at a local pub.